For those of you who are education people like me I need to first make very clear that I’m a constructivist at heart. There are lots of different theories of human learning, and Constructivism is the one that believe in whole-heartedly. Here’s a quick definition: “Constructivism is a theory of knowledge that argues that humans generate knowledge and meaning from an interaction between their experiences and their ideas.” (from Wikipedia) I know that my end-goal is to learn how to code, and I’m going to stab in the dark with lots of different resources (including websites, classes, and conversations) to do so. As I experience different things, I will build experiences that will hopefully deepen my understanding of what coding is and how I can use it in different ways. “Formalization of the theory of constructivism is generally attributed to Jean Piaget, who articulated mechanisms by which knowledge is internalized by learners. He suggested that through processes of accommodation and assimilation, individuals construct new knowledge from their experiences. When individuals assimilate, they incorporate the new experience into an already existing framework without changing that framework. This may occur when individuals’ experiences are aligned with their internal representations of the world, but may also occur as a failure to change a faulty understanding; for example, they may not notice events, may misunderstand input from others, or may decide that an event is a fluke and is therefore unimportant as information about the world. In contrast, when individuals’ experiences contradict their internal representations, they may change their perceptions of the experiences to fit their internal representations. As a teacher, I’ve come to know and believe that learning is always the most meaningful and genuine when it is about something that you are interested in. That means that the job of the teacher is observe students closely to learn about their interests. They support students to explore those interests. It also means the job of the teachers is to offer information and experiences in ways that builds off interests . For example, to learn math, you can memorize numbers and do worksheets. How many of you LOVE this way of learning math? (…my guess is not very many). Most children love being outside. What if you invite your class to go outside and colleact natural materials that they think are beautiful (leaves, sticks, acorns, etc.) After you gather all those materials, you can group them, categorize them, and sort them. You can count them, and figure out how many sticks you collected, and how many leaves. You can determine how many objects you have if you combine all of your groups together. (addition). You can determine how many objects you have if you remove only the sticks (subtraction), etc. What if your class is super interested in cars and trucks. You can go outside and count cars. You can track and graph the cars you see by color, size, and type. You can invite parents to email you pictures of their cars, invite students to calculate how many total wheels exist in all of their cars. You can invite your students to design and build a model of a car, using measurement and calculation to line up the wheels and make doors that open and shut. You can continue with experiences like these to explore all kinds of math, and I bet students would remember a lot more than the worksheet example because they would be interested in it. Well, I’m interested in learning to code, and I lay out the foundations of my interest in my post Why coding? Why now? My mission is to seek interesting resources that will teach me in ways that I can understand and connect to. Are you interested in coding? How can you get interested? This is another hugely important aspect of constructivist learning theory that will definitely come in handy as I take on my own learning venture. I am embarking on this learning venture on my own, but will be conscious of all the resources and supports around me. When I feel stuck, I’ll seek help from someone or something to push my learning forward. 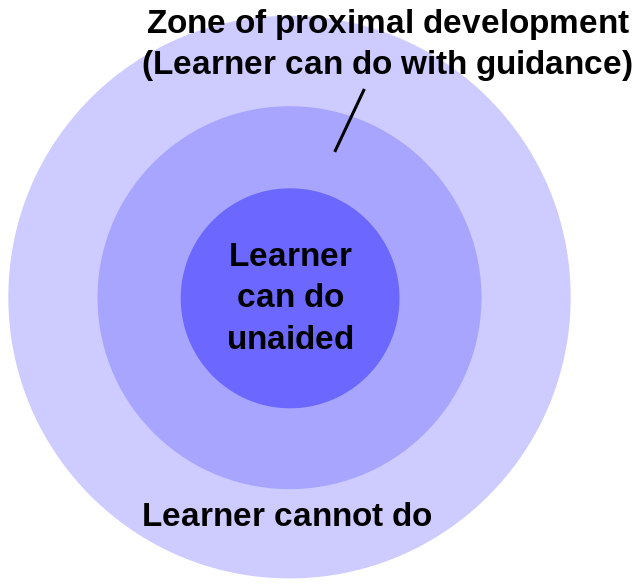 Right now I can do very little unaided, and I hope to discover and rely on my own zone of proximal development as I move forward.